Close to Vatican and St Peter. 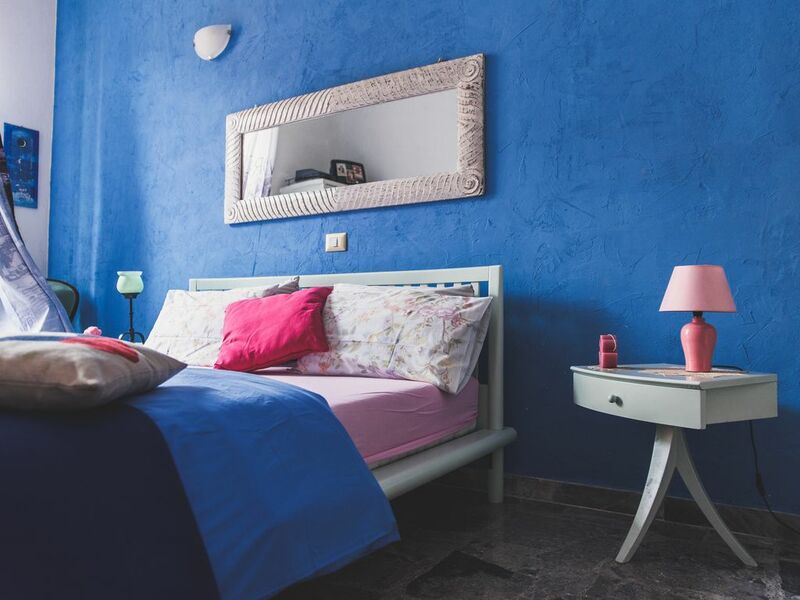 Home Sweet Rome is the apartment you are looking for your Roman holiday! The location is optimal to reach the main points of the city on foot or by metro. Ottaviano Metro 100m. The Vatican walls are about 80 meters and the Vatican museum with its wonders to 150 meters. Piazza San Pietro 250 m.
The newly renovated apartment is located on the 4th floor in a nice building with an internal courtyard. Nearby restaurants, bars and shops. Towels are provided, TV, closet. There are two large bathrooms with shower and dressing. The kitchen is spacious and equipped with appliances and cookware, dishes glasses and everything you need to prepare a delicious cheese and pepper Pasta or Carbonara! After a journey through centuries of history with breath-taking views of Rome, a city which never fails to amaze, driving a vintage Vespa, discover Fori Imperiali and walking in Trastevere enjoying a Grattacheccha, you can relax in our living room with sofas and dining table! Every detail is designed to make your stay unforgettable and unique in the most famous city in the world! Services: Air conditioning, heating, WiFi. City Tax due at arrival ( 3,5 euro per person per night) for max 10 days. Children under 10 y.o don't pay. Additional change of linen: 10 € per room. This apartment is utterly amazing! This apartment is utterly amazing. It is in a great location, not far from the Vatican. We got the shuttle bus from the airport and our hostess, Giovanna, advised us which metro stop to get off at. She let us in and was extremely helpful & friendly, giving us lots of local tips. The apartment itself was so clean, very comfortable and the decor is gorgeous - lots of lovely wee touches which just made it feel so homely. The area is adorable - there’s a patisserie right downstairs, a market across the road and loads of restaurants, cafés and bars nearby. It’s about a five minute walk from the Ottaviano metro stop. We were in Rome for four days and although I’m sure we would have had an amazing time regardless, this apartment really made it for us. We couldn’t bear to leave it and we will most certainly be back! I needed a place near the Vatican. But it was much more, a delightful neighborhood with a market and trattoria's. The apartment is quiet, bright, safe, cozy, just perfect to retreat from the thousands at the Vatican. Great privacy for two couples, or kids and parents, sharing the space. Bathrooms great, bedrooms spacious, great storage for suitcase and hanging clothes; great kitchen and sitting room. Just perfect. Thanks! The home was lovely and in perfect condition!! And our host couldn’t have been nicer!!! Would def stay here again!! We will definitely stay here again!! My husband and I stayed here for 5 nights and absolutely loved it! We were greeted by the hostess, Giavonna, who was so welcoming and helpful to explaining things in the apartment and the area. The apartment was beautifully cleaned and well updated, and in a great location!!! -- Lots of shopping, restaurants, and markets close by. Everything was a quick and easy walk but there are also close metro stations. We cannot wait to stay here again! Thank you again Giavonna for everything!! L'appartement est juste à côté du Vatican, mais dans une zone où l'on trouve vraiment des Romains (et, donc, aussi des magasins d'alimentation, notamment le fameux Castroni). Le métro est tout proche pour rejoindre des lieux un peu plus éloignés. Très propre, meublé de façon originale, la cuisine est commode et bien équipée. Si l'on veut pinailler, l'une des chambres peut être un peu bruyante (si les hôtes du B&B à côté le sont). L’appartamemto utilizzato è davvero confortevole e ben arredato; non manca veramente nulla! La posizione è strategica per potersi muovere per Roma sia con i mezzi che con auto propria. Sicuramente se avremo la possibilità di tornare a Roma non potremo che prendere come punto di riferimento per il soggiorno questo appartamento.